Caralie saw this on Our Best Bites and insisted that we make it. 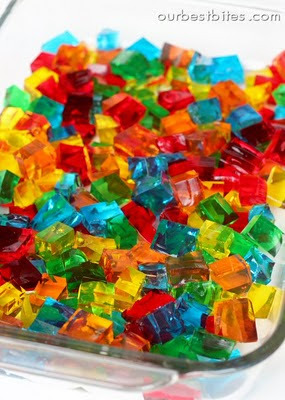 I was hesitant because one of the ingredients seemed questionable to me and I was worried that they would be super sweet. I was pleasantly surprised! These are really good and are not icky-sweet at all. And they are super fun for kids (and adults too). Give them ample time to firm up, though. Spray 4 small food storage containers (like Rubbermaid, Tupperware, or Ziploc) with cooking spray and set aside. 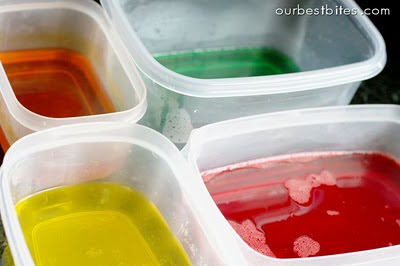 When the Jell-o has set, bring another 1 1/2 cups of water to a boil. While this water is heating, sprinkle the 2 packets of unflavored gelatin over 1/2 cup of cold water in a large bowl. Allow to stand about 4 minutes. Pour boiling water over dissolved gelatin and stir to combine. Add sweetened condensed milk and mix well. Allow to come to room temperature. 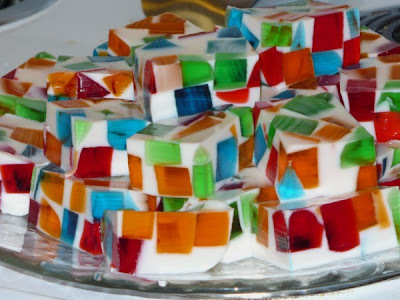 Pour the cooled milk mixture over the cubes and, if necessary, rearrange some of the colored Jell-o to make sure it is evenly distributed and not sticking out. Place pan in refrigerator and chill overnight. Cut into squares, rectangles, or various shapes with cookie cutters and serve. I made these for our ward linger longer and they were a huge hit! I thought the sweetened condensed milk would be nasty, but you don't even taste it!